Moving onto the Subaru Global Platform introduced for 2017 helps give the Legacy what Subaru says is 70-percent-stiffer torsional rigidity. But the real news has to do with added features and newly available power. The 2020 Legacy will be offered in Base, Premium, Sport, Limited, Limited XT, and Touring XT models. 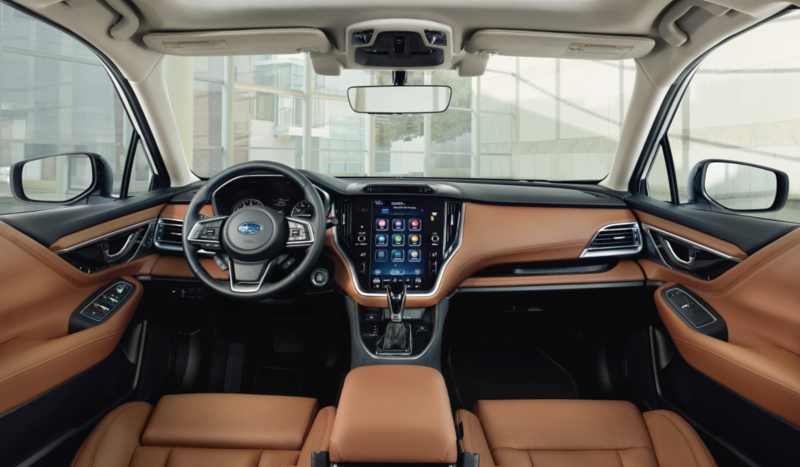 Standard on all will be Subaru’s EyeSight suite of high-tech safety features – which adds a Lane Centering Function for 2020 — along with Legacy’s traditional all-wheel drive. All but the Base model get a new 11.6-inch touchscreen that offers a split-screen function allowing the driver to display audio and navigation information simultaneously. 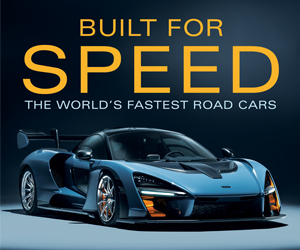 Other available features include Apple CarPlay and Android Auto functionality, in-car WiFi connectivity, STARLINK telematics system, heated and ventilated front seats, heated steering wheel, heated rear seats, 10-way power front seats with adjustable lumber support and driver-seat cushion extension, adaptive headlights, reverse automatic braking, a front-view camera, Nappa leather upholstery, and a DriverFocus Distraction Mitigation System that uses a camera to detect when the driver is fatigued or distracted. Although the standard engine is a heavily revised 2.5-liter flat four rated at 182 horsepower (up from 175), returning to the Legacy lineup after an 8-year absence is an available turbocharged engine for XT models: a 2.4-liter flat four rated at 260 horsepower that Subaru says can accelerate a Legacy so equipped to 60 mph in a very sporting 6.1 seconds; it replaces a 3.6-liter flat six of 256 horsepower. Both 4-cylinder engines are coupled to a CVT automatic transmission and Subaru’s signature Symmetrical All-Wheel Drive. 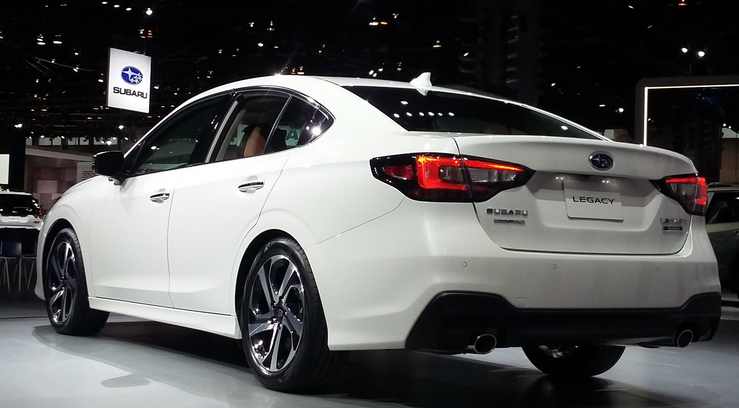 The 2020 Subaru Legacy is due in dealerships this fall, with prices to be announced closer to its on-sale date. The line between “regular” and “premium” vehicles is growing ever fuzzier, and the Legacy follows that trend by adding numerous new high-end features along with turbocharged power. Subaru has an advantage here in that it doesn’t have an “upscale” brand (like Toyota does with Lexus) that limits its luxury ceiling, and it appears the company is taking good advantage of that. 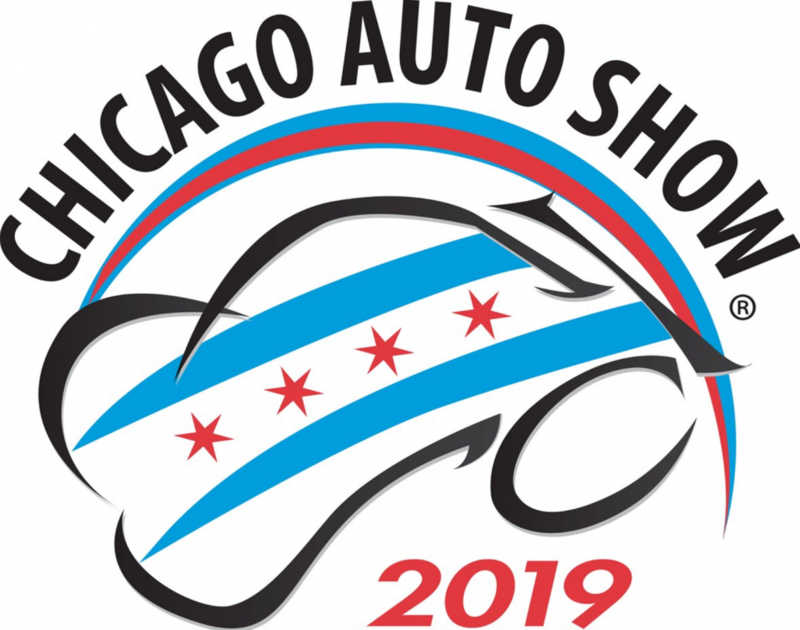 The Legacy may not have the promotional appeal of a crossover, but for those still interested in midsize sedans – and there remain many – the 2020 Legacy looks to offer premium features and capabilities at what will likely be lower-than-luxury prices. Written by: Rick Cotta on February 7, 2019.